Uhura is a badass. Whether she’s in the original show and films or the new ones, she’s pretty awesome albeit in different ways. Uhura is super smart. She’s a communications and linguistics expert who is a vital member to the crew of the SS Enterprise. She’s manned the helm when Kirk and Spock have been unavailable, and she’s manned the navigation and science stations on the bridge when the need arose, showing that she can turn her hand to pretty much anything. Uhura isn’t afraid to go against orders when she believes she and her crew are doing the right thing – for instance, she locks a colleague in a cupboard so she can transport Kirk, McCoy and Sulu on-board the Enterprise. In the newer films Uhura often has a more hands on role. She goes on missions with Kirk and Spock and she stops Spock from killing “John Harrison” and helps bring him into custody. 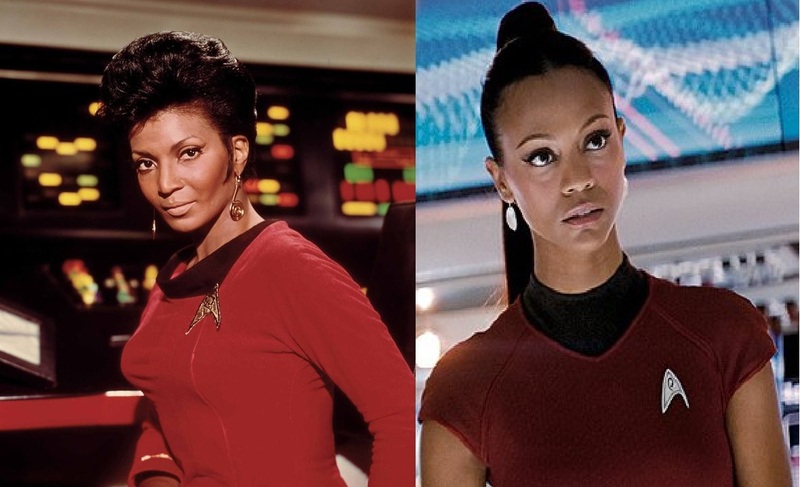 She has an interesting relationship with Spock and her friendship with Kirk is great but Uhura’s friendship with Sulu and Chekov is one of my favourite things about the original films and wish that would factor into the new films more.